Long Term Adherence to Low Carb for Diabetics? I don’t personally find long term adherence to a low carb diet to be difficult. It will be two years next month for me on Low Carb. The rewards outweigh any desire to change away from the low carb diet. In fact, the only pressure has been to maintain my weight on Low Carb since I keep losing. I never thought I would weight 165 lbs and I’ve been in this range for months. But, there is evidence that many people who are in trials are less motivated to keep the benefits of the low carb diet past a year. Here’s a study which makes that point (Ole Snorgaard, et.al. Systematic review and meta-analysis of dietary carbohydrate restriction in patients with type 2 diabetes. BMJ Open Diabetes Res Care. 2017; 5(1): e000354.). We identified 10 randomized trials comprising 1376 participants in total. In the first year of intervention, LCD was followed by a 0.34% lower HbA1c (3.7 mmol/mol) compared with HCD (95% CI 0.06 (0.7 mmol/mol), 0.63 (6.9 mmol/mol)). The greater the carbohydrate restriction, the greater the glucose-lowering effect (R=−0.85, p<0.01). At 1 year or later, however, HbA1c was similar in the 2 diet groups. The effect of the 2 types of diet on BMI/body weight, LDL cholesterol, QoL, and attrition rate was similar throughout interventions. Does Low Carb Itself Only Work for a Year? There’s nothing about the Low Carb diet itself which means that if you follow the Low Carb diet for a year the benefits end. My own HbA1C before Low Carb ranged from around 7-9 and now it is 5.2 at 18 months after I started Low Carb. Low Carb didn’t stop for me at a year. My 90 day average blood sugar is 92 per my meter. Rather, it is lack of long term adherence to the diet which is the problem. If a diabetic thinks that they can do Low Carb and all their problems will go away without any potential for re-occurrence they are missing the point of how they got messed up to start with. Re-introduce a high carb load and the diabetic symptoms will quickly return. People take the advice that they should increase their carbohydrates once the intervention ends and they just can’t do that. The Low Carb diet has to be followed for as long as a person wants to be non-diabetic. The transition strategy to higher carbs needs to be “just say no” rather than “try and find your carb tolerance”. On some level this is a problem with the nature of a study since the participants have a different set of motivations than someone who undertakes a Low Carb diet by their own choice. People who do a study are motivated by the study. A diabetic who finds low carb and reverses their diabetes has an entirely different motivation. Many times these studies are very selective in the population they are studying. Inclusion criteria is often to be newly diagnosed and un-medicated. That’s a less motivated crowd. They often have no serious symptoms (at least that they can see) and are less motivated to stay non-diabetic. Study participants are rewarded for participating in studies not long term adherence. Once the study is over their motivation ends. At the start of diabetes it is really simple to just pop a pill. And the HbA1c will react quite nicely to the pill. At least for a while. What they don’t tell you is that you will eventually be on Insulin. I used to be in a small Bible study group with older men. There were around 6-8 of us and all of us except once guy were Type 2 diabetics. We all shared the same trajectory. We all started with Metformin which worked for a couple of years. Then our blood sugar numbers got worse. And we were prescribed additional oral medications. Eventually, we were all put on Insulin. Once of the guys commented one day that they never tell you when they put you on Metformin that it would eventually result in you getting put on Metform. The cross over point is somewhere around 40% of energy. Assuming a 2000 calorie diet that’s 800 calories or 200 grams of carbohydrates. Above that point things get worse. 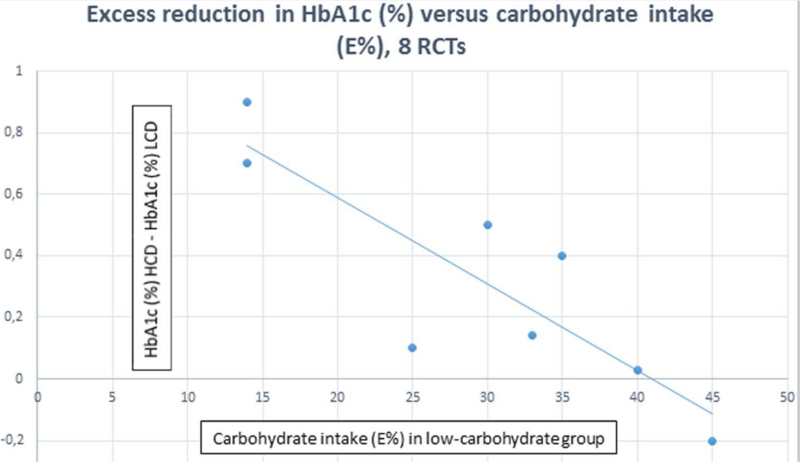 Equally the maximum benefit of around 0.8% reduction in HbA1c was found at 15% of energy from carbs. Again assuming a 2000 calorie diet that’s 300 calories or 75 grams of carbohydrates. That’s still high by my own standards.